The Irish Meteorological Society (IMS) held its 2018 Annual General Meeting on the 10th of May. The meeting was convened by the President of the Society, Declan Murphy. There were reports from the outgoing secretary, Sonia Lall, the treasurer, Aoife Murray, and committee member, Paul Halton, who was the local coordinator for EMS2017 which was held in Dublin. 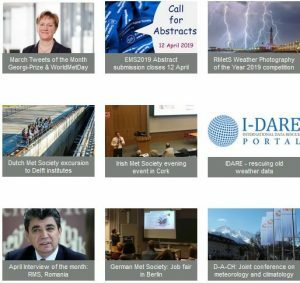 Those reports detailed a very busy year of activities, the highlight of which was hosting the EMS 2017 Annual Meeting at Dublin City University in September. The meeting was a great success and attended by 814 delegates from 46 countries. The IMS also had their usual full schedule of public lectures and events during the course of the year. All events were very well attended. At the AGM Tony Maguire was elected as the new secretary, and the IMS was pleased to acknowledge the contribution of Dominic Foley. Dominic stepped down after eight years as a voluntary committee member. Evelyn Cusack and Conor Sweeney were elected to the committee. 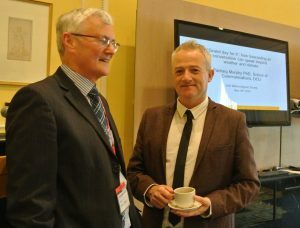 Dr Pádraig Murphy of the Communications School at Dublin City University was the guest speaker for our May Public Lecture. He presented an interesting talk with the title “Grand day for it: how forecasting as conversation can spread beyond weather and climate”. In his lecture he explored the role of weather forecasters in promoting political and social engagement about the areas of climate change and uncertainty. It was a very thought-provoking talk and it led to a lively question and answer session afterwards.